How can you turn small steps into big profits? Let your clients tell you where you're screwing up. Consider, for example, Granite Rock Company, a small construction-materials outfit that won the Baldrige award in 1992. The company espouses continuous improvement in customer satisfaction. They tell their customers, "If there’s anything about an order you don’t like, simply don’t pay us for it. Deduct that amount from the invoice and send us a check for the balance." They call it shortpay; I call it a thorn in the laurel or a mechanism with teeth. While many successful organizations rest on their laurels, Granite Rock does the opposite. They devised a system that makes it difficult if not impossible to become complacent about continuously improving customer satisfaction. A mechanism with teeth -- what a great visual. By telling customers NOT TO PAY for anything they don't like, Granite Rock finds out FAST where it's under-performing, so they can fix the problem FAST. Personally, I'm jealous. Although I work without a safety net, too, by offering an unconditional money-back guarantee on my copywriting, Granite Rock's "shortpay" invoice concept is way sexier. If you send out invoices (I don't, or I would borrow this idea yesterday), why not test this out on a small scale, and see what kind of results you get? If you're any good at what you do, a shortpay invoice will pleasantly blow away your clients ... not to mention the referrals you'll get. Because an outstanding product or service is often the best form of marketing. At a seminar in Minneapolis last year, Seth Godin said: "People judge their entire colonoscopy experience based on what they remember from the last 30 seconds." If you can envision a colonoscopy, I think you will agree with Seth. No matter what you do, it's exactly like a colonoscopy. A few years ago, I took my car in for an oil change. The service guys did a great job -- it was fast, friendly, and the price was right. They finished and brought my car around. I got in and found a big, fresh stain on the passenger seat. I motioned the technician over asked him: "Hey, can you tell me what this is about?" He looked at the stain and said, "Oh, yeah," like he'd just remembered. 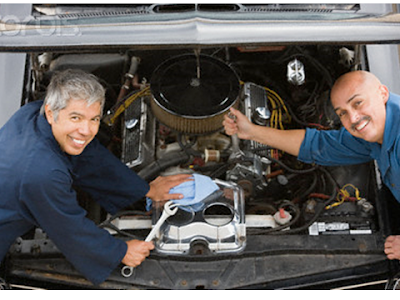 "You shouldn't put a can of STP in your glove box in the summer. It can overheat and burst open. I guess that's what happened." I said, "Well, did it levitate out of the glove box and hover over the seat before exploding?" He had no answer, of course. One of his guys must have been going through my glove box -- why, I don't know -- and spilled the STP can on the seat. No apology, no attempt to fix it. They thought I would drive away and not notice. How many people do you think I told about this? EVERYONE. I made it my hobby for the next 6 weeks to tell any English speaker within 3 feet: "You don't want to go to Hick & Brothers Auto Shop because they'll screw you over!" Now, think: What are the last 30 seconds of your clients' experience with you? a letter or box in the mail? your technician wiping his feet and closing the door on the way out? You'll find more ideas like these in my Free Report, Guaranteed Marketing. Henry Ford said a lot of smart things. One of them was this: "You can't build a reputation on what you are going to do." Now. Take a look at your recent accomplishments. Are the BIG things you're going to do actually getting done? If not, you might get more accomplished by thinking small. Example: One referral given today beats 10 that you're going to give later this week. Or: One prospect you call today beats 25 prospects who might call you, after your web site gets overhauled next week/month/year. Or: One thank-you note you write and mail to a client today beats that book you're going to write next month/year/decade. Many small steps taken will build your business -- and your revenue -- faster than one giant leap not taken. This is all Kaizen Marketing by another name, by the way. Small steps taken will build your reputation -- and revenue -- faster than a giant leap not taken. Temper Tantrum or Learning Opportunity? Saturday morning my wife called from the school where she teaches, asking me to bring her cell phone, which she had forgotten. It was essential for the lesson she was teaching. Not being a dummy, I said, "Sure, honey." Option #1: I could have viewed this 25-minute roundtrip drive as a huge inconvenience, wrecking my plans to liesurely read the newspaper over coffee. I probably would have arrived at her school in a foul mood and put my wife in a foul mood, making for a rotten rest of the morning for both of us. Option #2: I could have viewed the unplanned errand as an opportunity to listen to an old Brian Tracy audio, "Executive Time Management," that I found the other day in the back of my closet. With 25 minutes of drive time, I could listen to half the audio and absorb a few lessons. Not only did I avoid wrecking my morning and my wife's with a temper tantrum, I learned something extremely valuable from Brian's audio -- something I might have never discovered otherwise. Specifically, Brian's explanation of a PERT chart (see below) gave me a crucial insight that will help me finish a project that's been languishing for 3 weeks. It's no exaggeration to say I may have reclaimed 2-4 weeks of effort and more than $20,000 in revenue, all based on one insight from an audio I would have otherwise not listened to had I not had to make an unplanned drive to school to bring my wife her cell phone. What made the difference between temper tantrum (Option #1) and learning opportunity (Option #2)? Instead of seeing the chore that dropped into my lap as an interruption, I saw it as a chance to learn something. And it made my morning infinitely more productive than reading the newspaper. A Cure for the Common Business Card? 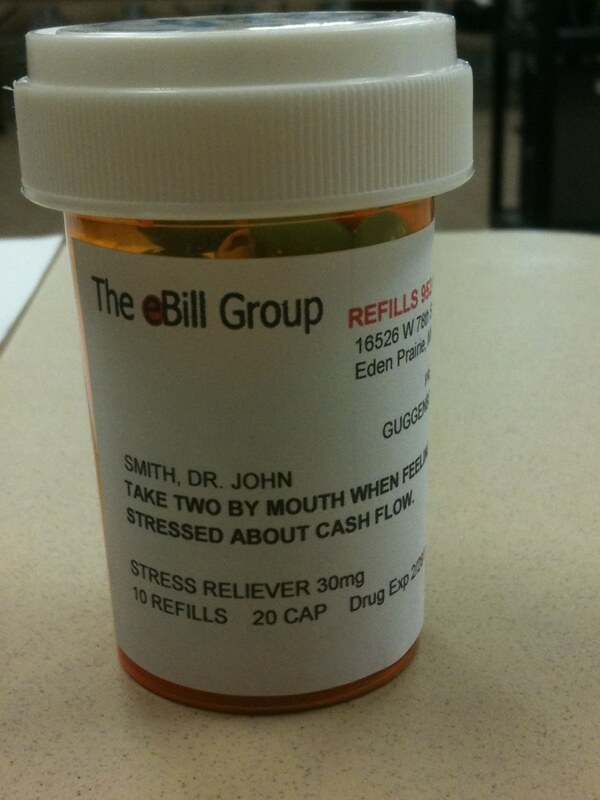 In a world of flat paper business cards, this stands out like a ... big pill bottle full of M&Ms. It's the un-business card that doubles as a clever keepsake from Sue Guggenberger at The eBill Group. Her company does billing, bookkeeping, and cash flow management for physicians in the Twin Cities and beyond. No, you can't put this in your wallet or file it with the other 373 business cards in your drawer, but that's the point. This is impossible to ignore or stack anything on. It has to sit on top of your desk or on a shelf by itself. Keep Sue in mind if you're a busy doctor who wants to streamline your practice. And keep her un-business card in mind if you want an alternative to the typical, dull-as-dishwater business card. I can't help you with 1. But I can help you give more referrals to your vendors, non-competitors, friends, community leaders, and of course, clients. That way, you'll get more referrals in return. I know what you're thinking: Giving referrals is hard. It's a hassle. It takes too much time. You have to give 5 or 6 referrals before you get any back. Etc. But here's a way to give more referrals -- and earn more in return -- simply by giving one referral. Many years ago, I heard a very famous pain expert give a lecture to a large audience. Although pain cannot always by managed with medications and other medical interventions, mental techniques like meditation can significantly reduce the suffering of those who hurt. This pain expert encouraged each of his listeners to go home and meditate for one minute a day. Quite surprised, I went up to him after the talk and asked him why he thought one minute of meditation would possibly do anyone any good. In a patient tone of voice, he asked me how long meditation techniques had been around. "Two or three thousand years," I said. "That's right," he told me. "So there's a very good chance that the people in this audience have heard of it before now. Those who like the idea have already found a teacher or a book and are doing it. For the rest of the people in this audience, meditation is the worst idea they ever heard of. I'd rather they go home and meditate for one minute than not meditate for thirty minutes. They might like it. They may forget to stop." Wise advice, don't you think? If you've ever struggled to do 20 pushups, try two sets of 10, or 4 sets of 5. Half the battle in finishing is starting. That's why slicing up an unsavory task can work -- any big project is easier, one small step at a time. Now, here's the deal with referrals: You've already heard that giving them is a great way to get them. If you like the idea, you're probably doing it already. If not, why don't you give out just one referral today? It's better than not giving out 30 referrals. You might like it. You may forget to stop. A big misconception about successful marketing (in general) and copywriting (in particular) is that it's all about creativity. Marketing -- defined as finding, getting, and keeping customers -- is really a numbers game. Know your numbers and you can play the game to win. Don't, and you won't. 1) What is your lifetime customer value (LCV)? In other words, how much does an average customer spend with you over their entire buying lifetime? When you know this number, you know how much you can afford to invest in customer acquisition (i.e., how much you can "buy" customers for and still profit). 2) What are your conversion rates? In other words, what percentage of people turn into customers after seeing your ad, visiting your web site, or hearing your networking pitch? When you know this number, you know what's working, so you can do more of it. You can also fix or stop doing what's not working. The point to all this? When you know your numbers, you can make intelligent decisions about how to spend your limited time and money. When you don't know your numbers, you are flying blind. And you will crash, eventually. Three weeks ago, I sent 2 project quotes to prospective clients. One week later, I received 2 checks from those quotes (100% closing rate). Two weeks ago, I sent one project quote to one prospective client. Last week, I received one check from that quote (100% closing rate). 1) My 100% conversion rate either means I'm a good salesman or my prices are too low. So I'm raising rates on my copywriting services ASAP to see if profits go up, even if my conversion rate takes a hit. 2) You can bet I'm sending out more than two project quotes this week! The numbers are very clear: More project quotes = more paychecks for me. How's that for motivation? Sidebar: I never call my quotes "quotes," or "bids," or "estimates," and neither should you. Why get lumped in with everyone else? If you do, you're competing on price -- a loser's game. Instead, when a prospect asks for a price quote, send them an "Outline of Services," a "Project Description," or some other term of your own creation. This helps put your business in a category of one, where there's no competition. Here's more about Kaizen Marketing, the continuous improvement of your most valuable activity -- creating and keeping customers. To recap: The first, simple step in the Kaizen Marketing process is discovery. Because you can't improve what you don't measure -- and you can't measure what you don't know -- you must know, clearly, where your money is coming from. 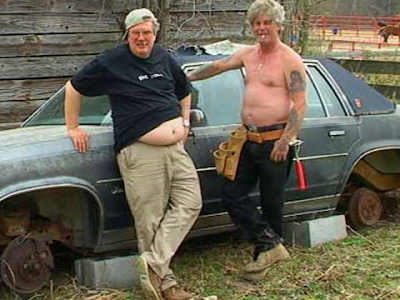 By systematically discovering where his income came from, Dunworth got a 56% jump in revenue from a $15 investment and about an hour of work. 1) He linked Google Analytics to his Google AdSense account. This showed him exactly which clicks on his web site were producing AdSense revenue. In his words, "The results were astounding." 2) He discovered that, of the 800 pages on his web site, 70% of the revenue was generated from just 3 pages (a perfect illustration of the 80/20 Rule). 3) He hired a freelancer to create an ad and displayed it prominently his web site, presumably on one of those 3 high-value web pages. Cost for the ad? Just $15!? 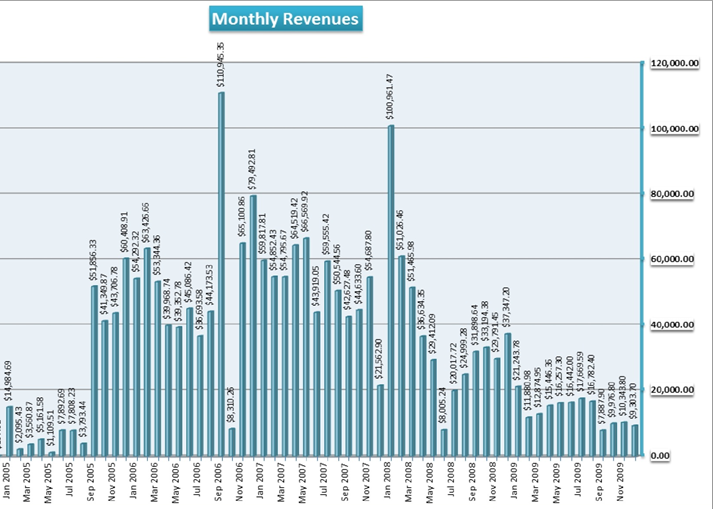 4) Within the month, his AdSense revenue rose from $533 to $832 (that's a 56% increase). Big profits often lurk in small areas. But you'll never know unless you look. Carefully. Painstakingly. Look. Now. Know this: You do NOT need to hook up Google Analytics to your web site to enjoy a 56% jump in revenue. You don't even need a web site. All you need do is open QuickBooks or call your bookkeeper. Get a report for the top 5 sources of revenue for your business. And study it carefully for surprising insights you can exploit, as Dunworth did. I promise you this: No matter what you think your top 5 revenue streams are, you won't be 100% accurate. And you may find results that are "astounding," as Dunworth did. As I wrote previously, this search for unexploited revenue streams led me on a Kaizen Marketing odyssey that ultimately put $2.1 million in the bank. But you can't improve or exploit what you don't know. So start looking at where your revenues are coming from. That's the first small step toward bigger profits. While the unofficial Google motto may be "Don't be evil," Zig's words are their real recipe for success. To whit, Google has been spanking Yahoo for years simply because Google helps more people get what they want. First, Exhibit A: Carol Bartz, the latest CEO firing at Yahoo. It's a simple rule of any market. The more information that is created, the more the value is reduced. And despite attempts to woo spending with bigger, bolder and more targeted ads, services that help consumers navigate that content, namely search, remain the big money makers online. "People tell me that content is king, but that is not true at all," says Rishad Tobaccowala, chief strategy and innovation officer at Vivaki, the digital-media unit of Publicis Groupe SA. "Most people make money pointing to content, not creating, curating or collecting content." Summary: Yahoo did not help enough people get what they wanted. So Yahoo did not get what they wanted. And Bartz got booted. Now, Exhibit B: Zagat, the restaurant review service that sprang from humble beginnings 30 years ago. Google bought it for a reported $125 million. People are “wondering where they should go, where they should spend their time, so to be able to offer accurate information is important, and that’s why we’ve been getting focused on reviews,” said Google VP Marissa Mayer. Summary: Zagat helped many people get what they wanted. So Zagat got what they wanted. Specifically, the founders, Nina and Tim Zagat, got a $125-million payday (more or less) and can now have everything they want in life. Now, you may not get bought by Google. But you can still have everything you want ... if you help enough people get what they want. Start with the most important people in your business life: Your clients. What do they want? And how are you helping them get it? By the way, this is a much broader question than, "What can I sell my clients?" The real question is: "What can I help my clients get?" Answer it enough times for enough clients, and they will help you get everything you want in life. Just as Zig said -- and Zagat proved. Even with $500 million in funding ... nifty new technology ... without customers, your business dies. Just ask Solyndra. If customers are the lifeblood of your business, then marketing -- creating and keeping customers -- is the heart of your business. Business is marketing. Marketing is your business. So, anything you can do to improve your marketing is a good thing. That's why I'm writing a lot these days about Kaizen Marketing, the continuous improvement of your most valuable activity -- creating and keeping customers. Here's the first, simple step in the Kaizen Marketing process: Discovery. Specifically, you can't improve what you don't measure. And you can't measure what you don't know. That means you must dig into your records and discover where the money is coming from. I promise you this: No matter what you think your top 5 revenue streams are, you won't be 100% accurate. Because Quicken, like your calendar, never lies. But your instincts and hunches about what makes your business money are almost always fuzzy. So make this a first step in the Kaizen Marketing process, which I will explain in the coming weeks. Discover what your top 5 sources of revenue are. That's half the battle in improving them -- and growing your business inevitably, one small step at a time. Six years ago, I accidentally created a business that put $2,159,342.40 in my bank account. By focusing the vast majority of my marketing efforts on the vital few activities that made the most profits. ... to $51,856 in September 2005 and kept climbing to $110,945 one year later, in September 2006. More than $2,159,342 flooded into my business in 5 years, before all was said and done. I promoted programs for companies that paid a couple bucks for every lead I sent to their web site using Google AdWords. I can't be more specific than that, but I can tell you the bulk of that $2.1 million came from a single Google AdWords ad that I honed, improved, polished, perfected, and rolled out to multiple markets in North America. ... but I can tell you about the process that helped me make a $2.1-million killing. I combined the 80/20 Rule with Marketing 101 to create a new concept (new for me, anyway) that you can use, too. I call it 80/20 Marketing. Because you should already understand Marketing 101, let's define the 80/20 Rule. You may also know it as the Pareto Principle, named after Italian economist Vilfredo Pareto, who observed in 1906 that 80% of the property in Italy was owned by 20% of the people. 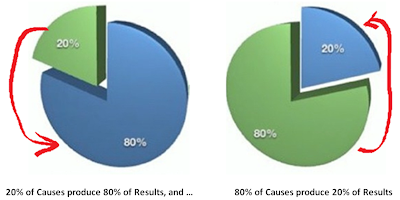 Stated differently, 20% of causes account for about 80% results, and 80% of causes produce about 20% of results. The world is unbalanced and unequal -- predictably so. Note: The ratio is rarely 80/20 exactly -- it may be 72/17 ... 88/11 ... 75/6 ... etc. But the numbers are always unbalanced. This last area is important -- marketing. Because marketing is one of the vital few things you do that really matters in business -- it's a 20% Activity that produces outsized results. One day, in May 2005, I thought: "What if I were to apply the 80/20 Rule to marketing, and do only those things that really made me money, dropping, delegating, or streamlining the rest? What would happen?" More than $2.1 million happened, that's what. In a word, it's replacement. You see, after I uncovered certain elements of my marketing that were producing small, but disproportionately large profits, I replaced 80% activities (the majority of marketing that was largely a waste of time) with 20% activities (those few things that produced disproportionately big results). Some days I worked 12 hours and had nothing to show. 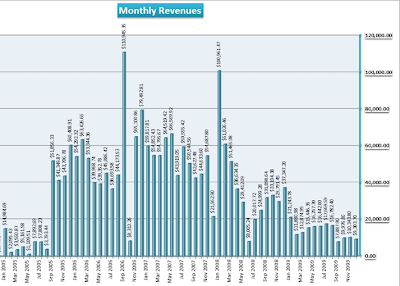 Other days, a 15-minute effort added $25 a day in revenue. Smart, focused work produced small, continuous, profitable improvements. Now. You may think: "Where do I find time for another marketing system?" or "I'm not the boss -- I can't change our business model to do this." Both excuses are invalid. Because you have plenty of time -- you're just misusing 80% of it. And 80/20 Marketing works for any business model, by refining and ramping up whatever success you're having now. closed down an entire business (it was time-intensive and no longer fun). stopped checking email more than once a day (a game-changer that freed up 2-3 hours daily). I increased annual revenue from this project by 10 TIMES, from $24,587 in 2004, to $244,504 in 2005. Then I TRIPLED IT, to $640,471 in 2006. The rest is history. I now teach a 4-week course on 80/20 Marketing that is changing lives for entrepreneurs. Whether or not an extra $2.1 million in high-net revenue excites you, the principles of 80/20 Marketing should. Simply put, most of what you do to market your business doesn't matter. Only a few things do. Do more of them, and your life can improve dramatically, rapidly, and predictably. That's as good a job of selling as you'll see in any supermarket, with a lesson you can apply to any business. The lesson? Features tell, benefits sell. Which means, to sell more of anything, put benefits first and features second. Unfortunately, about 95% of people in business get this backwards. 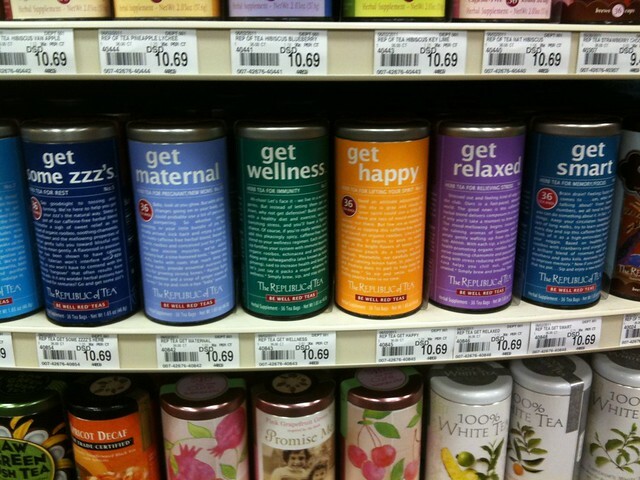 These headlines fairly leap off the shelves, compared to the dull, standard labels on other teas. So ... how do you turn features into benefits? Bad news: You have to think. Hard. An ordinary tea maker simply labels their product as "St. John's Wort." You've seen dozens of those. And one tea-maker's "St. John's Wort" is completely interchangeable with another's, because there is NO benefit to that name -- it's just a feature. But Republic of Tea created their own category of one by labeling their "St. John's Wort" with its main benefit: mood enhancement. In a word, HAPPY. Now. Look at your business. What features are you trying (without luck) to sell to clients? Take a cue from Republic of Tea and start selling benefits instead. You know that I preach writing and mailing thank-you letters to anyone who matters in your business life: clients, prospects, vendors, and referral partners, to name a few. In his excellent book, You, Inc. , Harry Beckwith writes: "Handwritten thank-you notes feel like gifts because you took the time to find the paper and envelope, write the note, affix the stamp, and gift-wrap your note in its package." 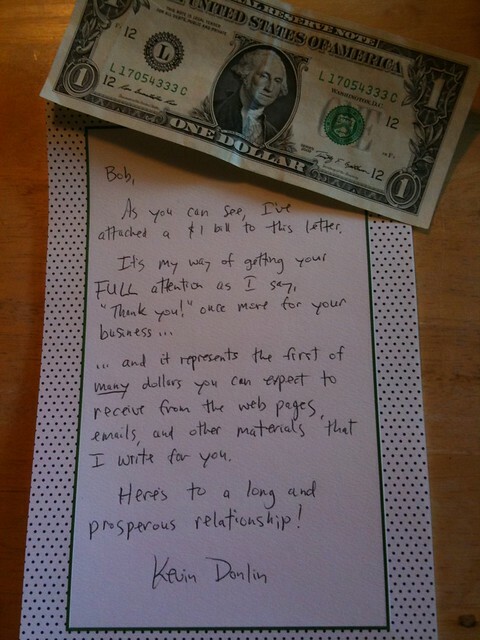 Well, here's a terrific twist on thank-you notes as "gifts," borrowed from one of my marketing heroes, Joe Polish. It's called a "stick letter." First, recall one of the reasons you mail thank-you notes to clients: To make them feel good about doing business with you. Because, if ignored, a client can quickly come down with a case of buyer's remorse. Should I have shopped around more? Is that product/service really worth the money? So here's a Big Question: How do you eliminate or minimize buyer's remorse and possible refunds? The answer, according to Joe Polish (and my own experience) is to send a "stick letter." A stick letter is simply a letter to make the sale "stick." In other words, ensure that the buyer of your product or service is happy enough to keep and use it. Best part: For a tiny investment of time and money, you can not only reduce refunds, you can delight your clients, and stimulate referrals. That's a triple play. What does a stick letter look like? As you can see, I've attached a $1 bill to this letter. ... and it represents the first of many dollars you can expect to receive from the web pages, emails, and other materials I write for you. Here's to a long and prosperous relationship! By the way, the dollar bill is called a "grabber" in direct-mail parlance. It's an attention grabber that forces the recipient to read the letter and find out why you sent them money. Mailing a stick letter to clients within 3-5 business days of their purchase -- even the same day -- is one of the best ways I know to reduce or eliminate refunds, ensure happy clients, and build your business. Win-win-win. There's really only one way to do this wrong: Mail a fake letter. Fake as in you don't mean what you say. Clients can smell fakery like a dead skunk, so don't write a single word in any stick letter that you don't mean 100%. And, if attaching a dollar bill offends your sensibilities, attach something else ... like a gift certificate good for an "emergency consultation" or some surprise extra service. Meanwhile, the potential upside of sending a stick letter -- in terms of client delight, follow-on sales, and referrals -- is HUGE. Sure, you've probably never heard of anyone in your industry doing anything like this. And that's exactly why you should try it. 4 Ways to Grow Your Business. How Many Are You Missing? How many of these are you failing to use? Pick an idea from the list above. Do it this week. Every time I analyze a bad week in business, the root cause is nearly always selfish behavior -- my own. Sometimes I catch myself peeking at the Tigers' scores on MLB.com or checking Facebook at work, for example. Or I may not give as much as I could to clients (in terms of time and attention) or prospects (in terms of being helpful). By contrast, looking back on a good week, I invariably find I was generous with my time and effort, to clients and prospects alike. They reciprocated by buying more of my services and referring me to others. Now. Look back at the week just past. Was it bad or good for you? Were you selfish or generous? Good news: If you aren't happy with how you did, you now know what to do. I've been called a "Forrest Gump" in online marketing. And I won't argue -- I keep finding myself in the right place at the right time. ... I was invited to join LinkedIn on November 10, 2003 (member ID #40,961 of 100,000,000+). Over the years I've learned a few things about marketing yourself and your business using LinkedIn -- some of it useful, some not. Want to learn something productive, or pointless (but fun)? If you ever want to know what your member ID number is, you'll find it in the URL of your profile. The number after id shows I was the 40,961th person to join. See that? 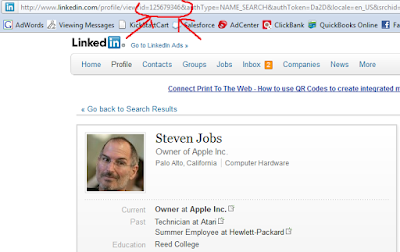 Steve Jobs is number 125,679,346 on LinkedIn. 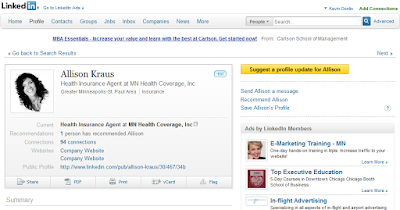 You can use LinkedIn to store notes about any of your first-level connections. You then have access to this information anywhere you have access to a computer. It's a great way to store call notes for later reference, for example. And you don't have to pay a dime (as of this writing) -- it's available on all free user accounts. 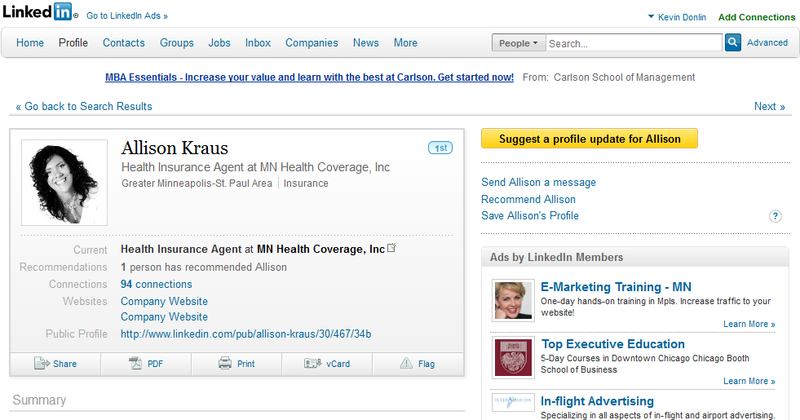 First, here's a screenshot of my friend Allison's LinkedIn profile page. I got an email from Allison yesterday that I wanted to save part of to her LinkedIn profile, so I could refer to it on any computer with Internet access. Now I can always remember whom to introduce her to in my network, because those notes are on her always available to me on her LinkedIn profile. This is a great way to record important data about clients or referral partners (hobbies, sports teams, favorite restaurants, etc.) so you can refer to it when you're on the phone or responding to emails. I hope you find at least one of these LinkedIn "hacks" useful as you build your business.